Costume Express Up to 75% Off! Costume Express is offering an additional 25% off of already reduced prices. Some costumes are up to 75% off. What a great deal for next year if you don't need to pre-pick the latest craze! 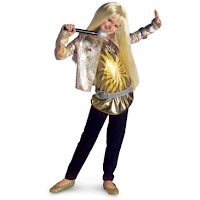 If you have a certain party theme coming up, there are costume ideas you can use instead of just for Halloween such as Hannah Montana at $19.99 priced normally at $69.99 not including the extra 25% off!